My first attempt with Painter 11. 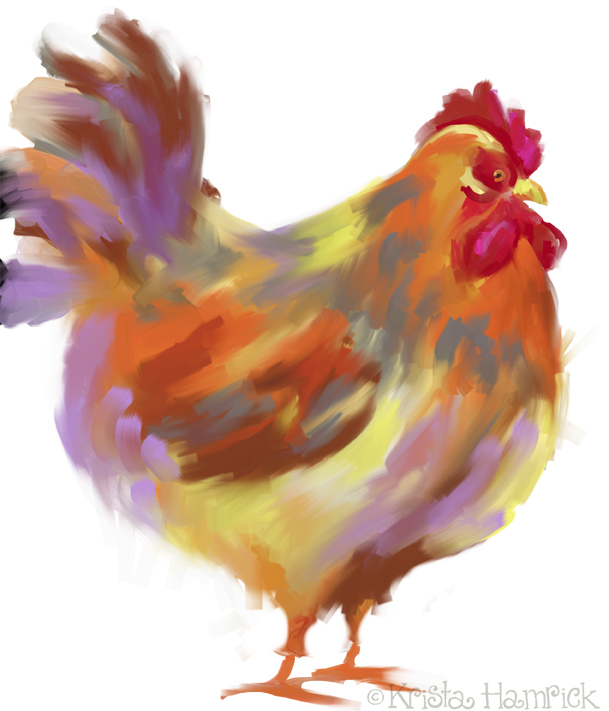 Asher’s chicken contribution, drawn on his ipod. Those are great! I am inspired to try Painter as well now- I love the look of traditional materials and how you achieved such painterly strokes digitally. Beautiful Chicken! Nice one Asher! he is sooooo cool! First attempt? I LOVE it!!! You obviously have a good eye for color, they are so lovely together. OOOOOOOOOOOOOOHHHH! Pretty pretty! She looks so soft and fluffy, I just want to pet her and squeeze her and love her! Wow, love all the colors you put in there. They look faaaaabulous together! Love the colours you’ve used in this illustration. she is nice an loose, great first attempt, you’ll have it mastered in no time. a very good attempt indeed! I love the colors and softness! Looks good – the brush strokes look appropriately soft and feathery.